Way back in June 2012 when I was browsing the puzzles over at Cleverwood, I came across a puzzle called The Lunatic. At the time I was spending a lot of time with hidden maze puzzles, and this appealed to me, so I bought one. Turns out this was one of the original mazes made by Marcus Allred, who popped up on Kickstarter a little while later. I backed his first venture there too! 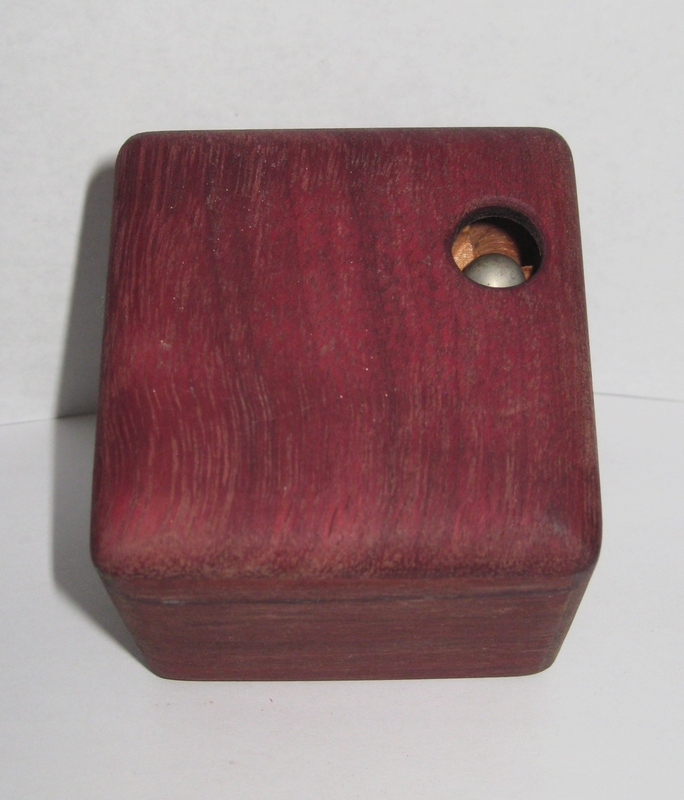 The original puzzle, made with a Purpleheart exterior is a little over 2.5" x 2.5" x 2.5", and comes with a single steel ball which you drop into one of the holes, then navigate through a blind maze, before the ball pops out the hole on the other side. It's not terribly difficult, and I'd even go so far as to say it's trivial. There's no dead ends or chances for the ball to get stuck, you can put the ball in one side, and rock the cube back and forth, and the ball will pop out. The challenge is really to understand the maze, and get the ball out in as few movements as possible. Doing that makes it a little more challenging, and more interesting as a puzzle. At one point Marcus popped up on one of the puzzle forums I frequent, and we started talking about the puzzle. Apparently he finished the puzzle using Orange Oil, which helps bring out the colour of the Purpleheart. I certainly didn't know that, and I know a few other puzzle builders were interested in that process. It's looking a little dry these days, and I may have to refinish the puzzle to bring back its original luster. 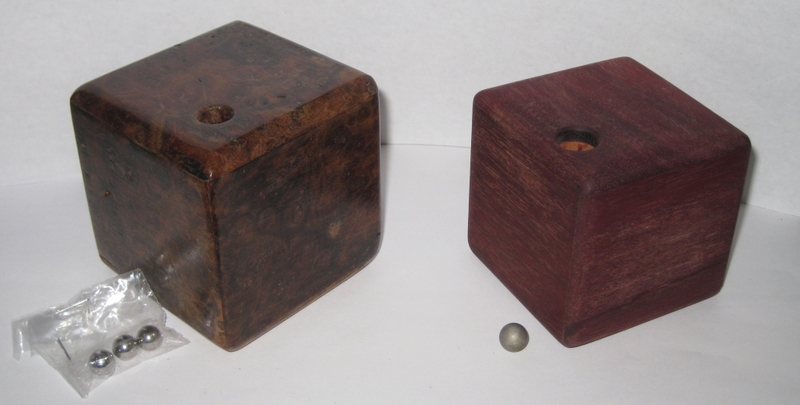 The Maze above is the result of that first Kickstarter project, a larger, 3" maze with a Walnut Burl exterior. Marcus has certainly refined the process from that first cube, with the entry holes to the maze being both smaller and better defined. The visibility of the internal maze which is made from a much less exotic wood is minimal, and overall it looks like a more polished puzzle. The difficulty is much the same as the original, and won't provide much of a challenge, unless you follow my suggestion to map the internal maze, and then navigate it in as few movements as possible. Still that's not the real attraction of the work Marcus is doing. He's finding some of the most beautiful burl woods out there, and working them expertly into beautiful works of art that are also puzzles. 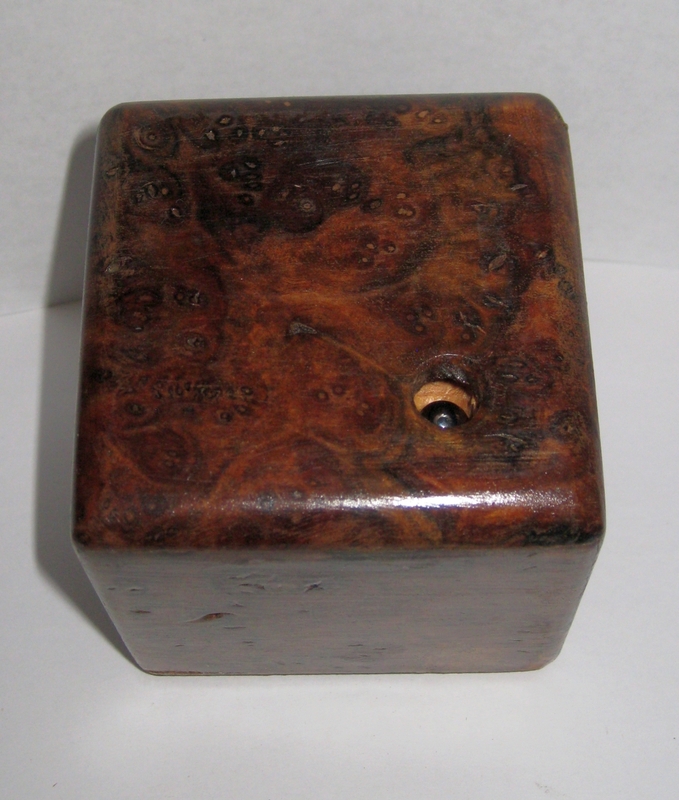 Some of his more recent work includes using the burl itself to create the maze, and then encasing it in a clear shell. Adding two balls to the puzzle of different colours and then creating challenges to swap the locations of the balls and so forth. The challenge to work with burls like this without having the wood shatter or chip is no easy task, and Marcus has refined his techniques to produce excellent results. His latest Kickstarter offering up some of the new designs has just been successfully funded, and I look forward to seeing what he does next. Might be time for me to pick up one of his newer puzzles, and see how far he's come. Marcus now has a new website, so head over there if you'd like to pick up one of his puzzles. If you're looking for something which will stand out on the puzzle shelves, this may well fit the bill.